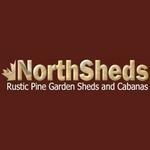 North Sheds, in Mount Albert, ON, manufactures and supplies solid pine sheds and cabanas that have many functional uses, including storage sheds, garden sheds, and more. Their prefab sheds enable freedom in design and placement, with the average shed completed in 3 hours, including floor and shingles. Their sheds are available in a wide range of sizes to suit everyone's specific requirements. Products Carried: Based in Mount Albert, Ontario, North Sheds manufactures and sells practical and aesthetically pleasing solid pine sheds and cabanas. North Sheds uses only quality white pine and every building is constructed to the customers exact specifications Their prefab sheds have many functional uses, including garden sheds, utility and storage, as a bunk house, and more.